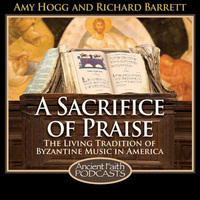 Amy and Richard talk to John Michael Boyer, the Associate Musical Director of Cappella Romana, and co-founder (with Fr. Dn. John El Massih) of PRÓTO. John is a cantor, composer, and teacher based in Portland, Oregon. In the part 1/2 of our conversation, John talks about his musical background, his introduction to chant, and his involvement in projects like the Cappella Romana Divine Liturgy in English recording, among many others.